It’s interesting to note that a $3750 phono stage is now considered, among some audiophiles, as entry level for delivering vinyl sound as it’s meant to be heard. Sure, there are relatively inexpensive examples that do a fine job—the excellent Rega Aria is priced at $1500—and some expensive models that don’t, but in my experience, higher priced analogue gear sounds better. You gotta pay to play. My reference Sutherland Engineering DUO monoblock Phono Preamplifier was so good in review, I purchased the unit(s). 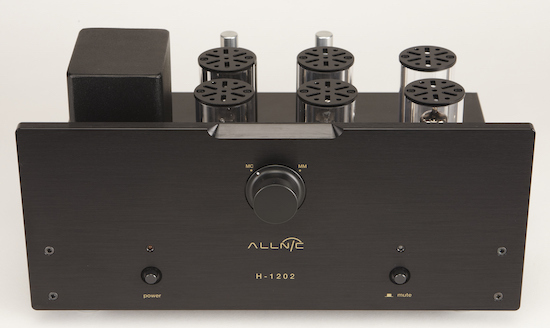 The DUO is priced at $4000, slightly more than the subject of this review, the brand new Allnic Audio H-1202 Phono Stage at $3750. My DUO benefited from some serious trickle down goodies from Ron Sutherland’s $10,000 PhonoBlock Phono Stage. This new Allnic Audio ‘entry level’ phono stage benefits from the Korean company’s esteemed analogue lineage, with trickle down tech from its $39,000 H-8000. The H-1202 is the upgraded version of the highly regarded H-1201. The 1202 has a price increase of $300. David Beetles of Hammertone Audio, Canadian distributor of Allnic Audio electronics (he’s a very kind, patient and helpful individual) sent word that ‘the H-1201 is identical in specs other than voltage divider and corrector tubes (7233 and 5654)’. I had not heard the now discontinued H-1201. The 1202’s starring role is taken by 4 NOS Mullard E180CC gain tubes (NOS is the acronym for New Old Stock). Interestingly, the E180CC originated as a computer tube that Allnic Audio designer Kang Su Park discovered sounded wonderful in his designs and are plentiful. In fact, Allnic recently purchased 2000 NOS E180CC tubes. But, with a 10,000 hour heater life, I figure retubing the E180CCs won’t be a problem any time soon. The H-1202 uses the following tubes: Four NOS E180CC twin triodes, one 7233 NOS and one 5654 NOS. Lovely tubes in chimney sexiness! High quality Moving Coil Step-up Transformers with Permalloy cores with variable gain (+22dB, +26dB, +28dB and +32dB) More on gain/loading later. On the front, brushed aluminum panel (also available in black), there is large rotating knob switching between moving magnet and moving coil cartridges and two small black push buttons coloured with orange (left/power) or red (right/mute) LEDs. On the rear panel, you get MM and MC Inputs and two screw-type ground connectors. I did not use the ground—no humming or buzzing. There is one set of RCA Outputs. The H-1202 ships with a standard AC IEC power cord. Discard. Upgrade the unit with a better power cord. It deserves it. I used an inexpensive Anticables Level 3 Reference Series Power Cord ($330/1.5 metre) with excellent effect. You won’t want anything getting in the way of Allnic’s sound philosophy. Comes in black, too. My choice if purchasing. The unit has dimensions of 310mm x 230mm x 140mm (W x D x H) and comes in at a welterweight 4.5 Kg. As such, moving the 1202 between systems and racks was easy (like all tubed units, it requires air flow for ventilation). I graced the unit with my Rega RP10/RB2000/Phasemation PP-2000/Jeff Rowland Continuum S2 Integrated Amplifier/Alta Audio FRM-2 Celesta setup. The Allnic graced the hell out of it right back! I also played the H-1202 on my buddy’s system: Rega P5/RB300/Rega Apheta/Prima Luna Prologue Preamplifier/Prima Luna DiaLogue Seven monoblocks, and Von Schweikert VR-4SR MK IIs. Detail of one of the Moving Coil Step-up Transformers with variable gain (there are two transformers that must be set at the same value). I’m hoping a careful read of the section below will explain how Park’s gain/loading system works. It can be a little confusing for the novice at first, but the musical results are definitely worth your time. On the top of each channel’s MC transformer on the centre rear of the chassis deck of the H-1202, there is a rotating control. 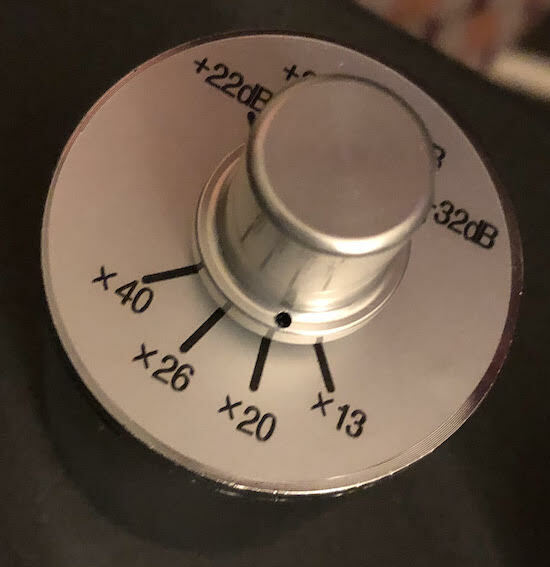 Turn the control knob to select from four gain factors: +22dB, +26dB, +28dB and +32dB. Combined with the H1202's 40dB native gain, for MC there is 62dB, 66dB, 68dB and 72dB of gain available. Each of the second set of indicators on the top of the transformers only marks the impedance tied to the gain setting diagonal to it. The impedance and gain relationships are not user adjustable. I highlighted the most important information. It was the same on the previous model. As such, cartridge loading has only four settings and is not adjustable. With some research and fun trial and error, I think that 99.9% of vinylphiles will find a sweet spot for even the lowest power and finickiest moving coil cartridges. However, if you are a serial tweaker, VTA nut, or just have to have the ultimate in moving coil cartridge adaptability, the H-1202 may not be for you. Yet, even if you are among that small number, please stay with me. There’s a huge payoff coming. For the record, I contacted Allnic and below is the correct information sent from on high (this very important information is either missing, incorrect, or confusing in some non-Allnic internet sources). ×13, ×20, ×26 and ×40, equate to 29Ω, 69Ω, 117Ω and 278Ω impedances. Each of the second set of indicators on the top of the transformers only marks the impedance tied to the gain setting diagonal to it. The impedance and gain relationships are not user adjustable. You should experiment with the gain settings to find the best setting for your cartridge. Use identical settings for both transformers to avoid channel imbalance. My Phasemation PP-2000 tech specs suggest 200Ω but sounded best after some knob twirling on the x26 (117Ω) setting with its corresponding 28dB (+ 40dB = 68dB) of gain. A little experimentation and you’ll be fine. But, be sure, loading and gain settings can make a difference, and when I landed on the magic number, the Allnic’s sound snapped instantly into focus! It’s not a chore. Have fun with it during the very important break in process. You’ll find your cartridge’s sweet spot. Beetles mentioned the new, shipped from the factory phono stage would have 20 hours on it. I threw another 30 on it (thanks Decca/Bohm/Bruckner 4 with the 38 minute Side 1). Okay, so, I snuck a listen during those 30 hours! Wouldn’t you? I tried not to, but some nice sound was coming from my music room. Yet, during some lengthy (breakin) sit downs, something was bothersome. Midrange was congested, bass was there, but not with authority or character—it seemed a little ‘off’. Patience, patience. You think after 25 years reviewing, I’d learn my lesson. Don’t judge too soon, especially during the suggested break in period. After 50 hours, a remarkable transformation took place, made even more emphatic and musical by my final choice of gain/loading position (28dB/x26). Congestion was gone, a beautifully clear midrange remained and bass was deep and absolutely gorgeous. Imaging was incredibly precise and the wide and deep soundstage was musically inviting. The unit, even when driven to high levels by my Jeff Rowland, was silent and provided inky black backgrounds. Much like my Sutherland DUO, a top class phono stage such as the Allnic Audio provides these audiophile maxims. And, unlike one or two high priced phono stages I’ve heard, the soundstage does not crap out or implode when faced with lifelike, macro dynamics. Serious auditioning began with Classic Records’ magnificent reissue of the Royal Ballet Gala conducted by Ernest Ansermet. What a fine conductor he was—all the ballet excerpts, including Swan Lake, Sleeping Beauty and The Nutcracker sound fresh, invigorated, and are highlighted by the most marvellous playing and, of course, a legendary Kingsway Hall recording. Much like my DUO, the power of the orchestra is to the fore, but was heard in total balance, just as Ansermet directed it. Where the Allnic truly shined was in image precision, instrumental timbre, transparency and the luscious musical decay on the back ends of notes, especially strings, harp and guitar. So incredibly tactile. And never heard so musically from one of my favourite records. My flute teacher, Harold Clarke, was principal flute of the ROH Orchestra on this LP. I never asked him about it way back in 1981, when I was too busy to be an audiophile (although, the seed was there. Damnit!). When the oboes begin their triplets in the Swan Lake intro, I revelled at the accuracy of their timbre (easily recognizing the different playing styles of the two 1950s ROH oboes—one English, one American). Also, instrumental separation was brilliant; refined and beautifully transparent in the Kingsway Hall acoustic. It is so good to hear the instruments of the orchestra sound so perfect in their choirs or as solo instruments. The famous harp cadenza was dazzling—not only beautifully played, but the 1202 grabs those large, ungainly strings and won’t let go. As such, you’ll hear changes in pedalling (a creak or two), and the weight of the fingers on the thicker lower strings as the player descends ritardando after the glissandi. Here, the transparency and detail is scarily good, yet the quality of the instrument’s sound never fluctuates. We are deep into musical Narnia and way behind the wardrobe. The Allnic’s performance of this record alone is enough to sell this fantastic phono stage. You’ll have long forgotten if your preferred impedance is a hair off. After umpteen play throughs of Royal Ballet, I threw on some jazz classics—We Get Requests (Oscar), Waltz for Debby (Bill) and a few others. Even though I’d rank both of these among the top five greatest jazz performances/recordings, and heard them both many times, the Allnic showed me a few tricks that I had not heard heretofore. Bass, especially of the solo string bass variety, sounded spectacular—rich, refined and really showing off the (harmonics) tone decay that I mentioned previously. Whether Scott LaFaro or Ray Brown, the playing sounded divine on the H-1202. And the two piano legends were no slouches, either. From the Chopin touch style of Evans to Peterson’s stunning technique, every note was heard in its place and with the hammer on strings felt as well as heard. Two remarkable albums that should be in every collection. Village Vanguard clinking glasses and mumbling? Hell yeah! Blues voices such as Philadelphia Jerry Ricks and Doug MacLeod sounded very personal and emotional. If soul and musicality are present in a voice, you’ll certainly hear it on the Allnic H-1202. And even the most subtle nuances from the accompanying instruments are heard. Nothing escapes. The total effect is immediate. The 1202 is not a spotlight or microscope. Your ears will be the sleuths courtesy of the Allnic topology. Always the best musical equation. All of these albums, which were the LPs of choice for the review and played over and over again, sounded equally beautiful, but slightly different on my Sutherland phono stage. The Sutherland comes in around the same price as the Allnic, but with very different topologies. The DUO is solid state and has two chassis. If you’re expecting me to choose one over the other, that will be very tough! My friend chose right away and purchased an Allnic H-1202 after the first hearing, and over the DUO (read about the adventure below). However, either will grace your components. But please, with components of similar quality/lineage. Pairing these with a cheap moving magnet cartridge and an entry level turntable will still see enormous benefits, but not as paired with like-minded kit. The Allnic Audio H-1202 is a game changer. I took it to my friend’s place. He’s being going nuts trying to get his system to sound better. He changed the taps on his monoblocks to good affect. Many other tweaks did not work. Then, I sprang the Allnic in the system. The change was remarkable (it was replacing an inexpensive Musical Fidelity phono stage). A completely different system. We were both floored at the improvement. In fact, I’ve never heard such a positive change in a system’s sound from just one component. He’s had his unit in his system for more than a month now and is remarkably happy. Vinyl is still resurgent, and the days of 25 cent Bluebacks are a thing of the past. Everybody knows the magic. And they want in. A quality phono stage is the natural step after a good turntable and cartridge. It’s an unbreakable analogue triumvirate, sadly, often distilled to a happy pair because of lack of awareness or cost. If you want the best out of your vinyl, you have to invest in a very good phono stage. They must be getting popular because there are a lot about. Beware, though. Read. Research. Ask. Audition. I’ve mentioned that a few expensive phono stages are not what they advertise, at least to my ears. The Allnic Audio H-1202 is not one of those. It really is a forever after machine. Very highly recommended.